Realistically, we believe that it is rather difficult to make a fortune by renting these old houses. It is only therefore an expression of our affection for the preservation of old times, a small token of our debt to the history of the island and to preserve our identity from the concrete monstrosities, the new buildings of today, constructed with little taste or respect for the environment. Nowadays the thinking, living creatures are returning to nature and to their roots. The Stone House you are staying in is our recognition of our Ancestors and paying our respects for the World they have made and we are now able to enjoy. 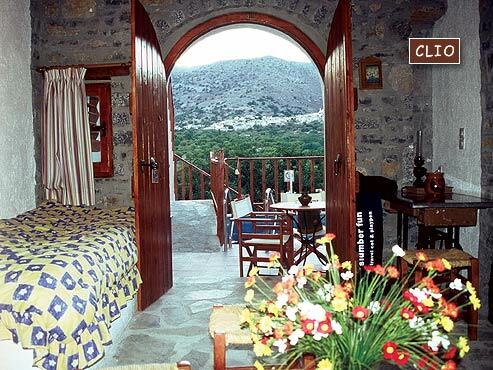 We would like to thank you for your preference in spending your holiday in the Traditional Homes of Mavrikiano, Elounda. We trust that the quality offered meets with your requirements and living standards. Please do not hesitate to let us know, if you have any particular need, which we will be glad to meet. At the entrance of the Gulf proudly stands the venetian port on the island of Spinaloga and daily boat trips are organized on hourly basis. 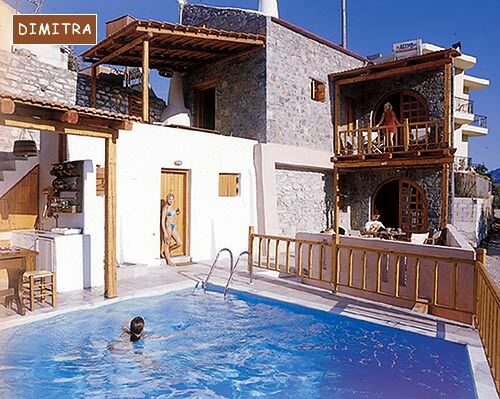 The Traditional homes of Crete include 9 Apartments. 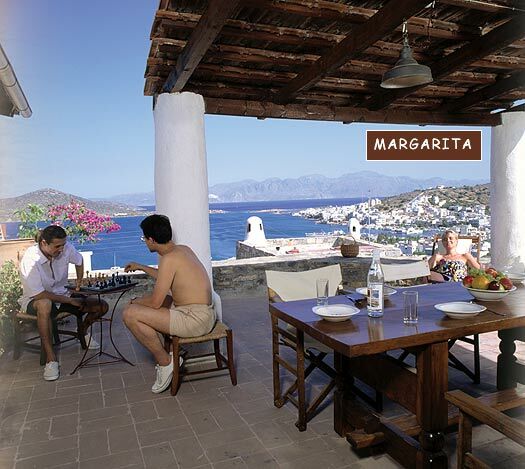 1)MARGARITA is located in Mavrikiano, overlooking the bay and seaside village of Elounda. It can accommodate up to 6 persons (3 couples). On entering, the courtyard there is a small fully equipped kitchen on the left and a bathroom on the right. The ground floor consists of a sitting room with a stone fireplace, dining room and up a few steps to the first of the three bedrooms containing a double bed. From here, the stone steps lead to the first floor master bedroom with twin beds, up another flight of steps to the third bedroom with twin beds and a door leading to the veranda/terrace with a summer kitchen and dining area. Spectacular views of Elounda and Elounda Bay from the terrace. 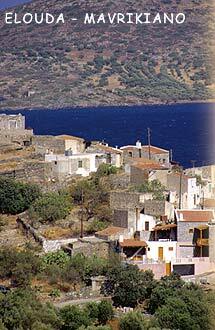 Location: The beach is located 10 minutes walk away and about the same for the village of Elounda, about 1 kilometer. 2)LEONIDAS it can accommodate up to 4 persons. 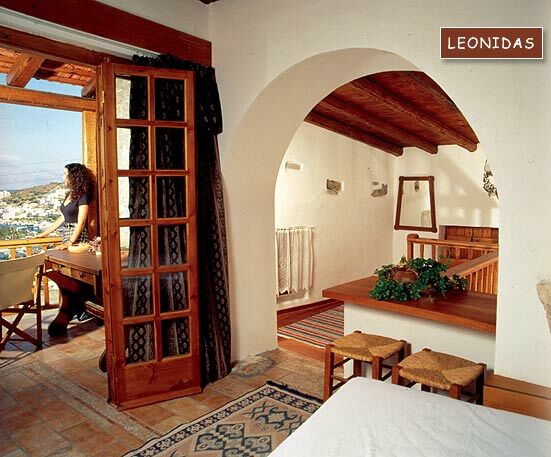 On entering LEONIDAS there is the sitting area with a fireplace, dining area and a fully equipped kitchen area. The sofa converts to a child-sized single bed. The bathroom is located through a door on the left. On the right is the stone staircase to the upper floor. On the mezzanine floor, there is a single bed and a few steps more lead to the master bedroom and the terrace equipped with a summer kitchen and dining area. 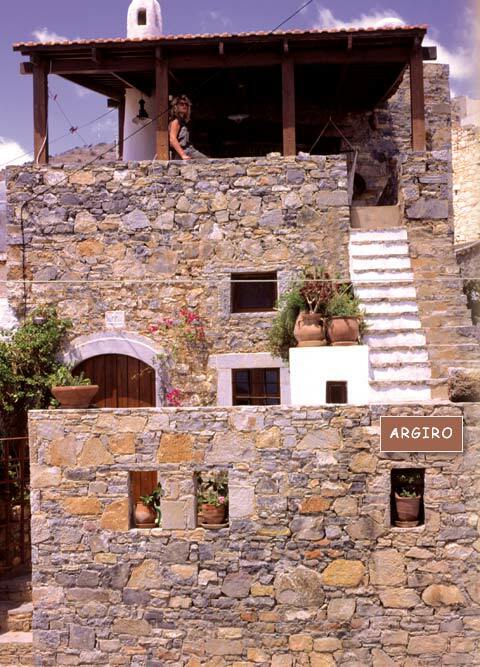 3)ARGIRO is a traditional stone house, built in 1905. Rebuilt in 1930 and again when it was bought by the well-known architect Theodosopulos in 1965, who restored it as it is seen today. Stone steps from the street lead into the small stone courtyard with lots of flowers. On the right is an entrance to the small bathroom. On entering, the House is the small kitchen and the dining area is up a few steps containing a stone fireplace and a loft area over the kitchen with a large bed. The living room has a stone fireplace and sofas that convert into beds. From here the stone staircase leads to the terrace with summer kitchen and the master bedroom with a double bed. 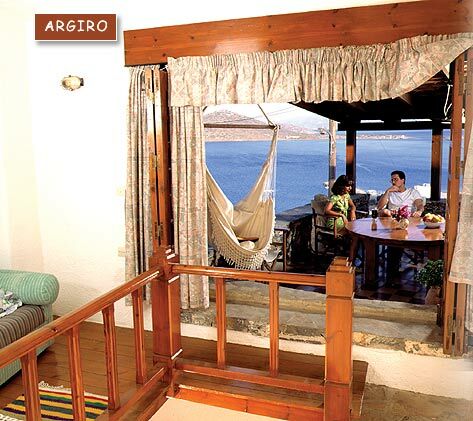 Wonderful views of the Gulf of Mirabello and Elounda from the covered terrace. 4)EFTERPI is part of an old Church demolished by the Turks at the end of the 15th century, has been rebuilt using only stone and wood. Reverence and respect of the old structure has been exercised with the help of the local people and their stories. Furniture and fittings are copies of original pieces presently exhibited in the Historical Museum of Crete in Heraklion. The entrance to the Home leads to a small courtyard with an open sitting area and a complete summer kitchen. The door to the left leads into the main room with sitting area and two single beds. On the right is a fireplace, a single bed and the kitchen. At the back is a full sized bathroom with Jacuzzi. The wooden stairs to the right lead to the attic/loft area bedroom with double bed. The House can accommodate 5 adults in the two rooms. 5 KALLIOPI is part of an old Church demolished by the Turks at the end of the 15th century, has been rebuilt using only stone and wood. Reverence and respect of the old structure has been exercised, with the help of the local people and their stories. Furniture and fittings are copies of original pieces presently exhibited in the Historical Museum of Crete in Heraklion. The entrance to the Home leads to a wooden veranda and the front door. 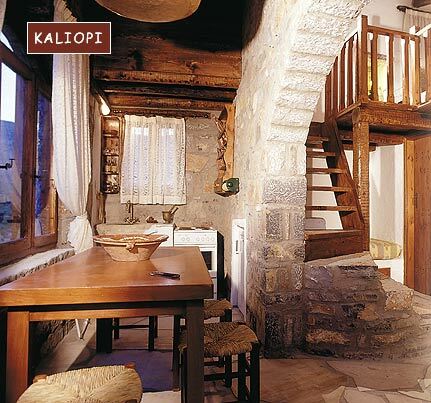 On entering Kalliopi to the right is the main room with the sitting area to the left containing two single beds. On a lower level is the fireplace, a single bed and the indoor kitchen. Towards the back of the home is a full sized bathroom with Jacuzzi. The wooden stairs lead to the attic/loft area with a large double bed. The House can accommodate four adults on two separate rooms. 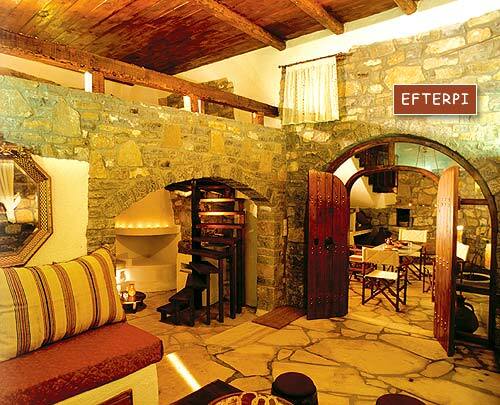 6)DIMITRA the entrance leads to a small hall sitting area with canopy and table and a small fully equipped kitchen, leading to a twin-bedded room with fireplace in the far corner. On the right a small twin-bedded room leading to a full sized bathroom with Jacuzzi. The French doors from the main room lead to the veranda with open and shaded areas, with an ample sized pool inviting you for a dip. To the right of the pool is an outdoor kitchen and a large table for six, shared with PENELOPE. All the furniture are copies of originals found in the Historical Museum of Heraklion, Crete, but the lamps and fittings are original. Tiles used are hand made, dated c 1920, taken from old demolished houses and the marble sink was found in a Turkish Hammam. The taps are copies of those of the 1920's. The reddish plaster on the walls is made of ground tiles, the same material that was used in the monasteries of the period 14th - 16th century. The Icons built into the walls were found wrapped in sacks on the site, during the reconstruction works. Private parking for two cars. There is evidence handed down through the generations that there was a church on this site many years ago. 7)PENELOPE the entrance leads to a common open area with an ample sized pool and a summer outdoor kitchen shared with the occupants of DIMITRA. The stairs lead to the terrace and the entrance to the home. On the left is the fully equipped kitchen leading to the main twin-bedded room and to the right is the fireplace. The full sized bathroom is next to a smaller bedroom with twin beds. The wooden stairs lead to the attic/loft area with a double bed. All the furniture are copies of originals found in the Historical Museum of Heraklion, Crete, but the lamps and fittings are original. Tiles used are hand made, dated c 1920, taken from old demolished houses and the marble sink was found in a Turkish Hammam. The taps are copies of those of the 1920's. The reddish plaster on the walls is made of ground tiles, the same material that was used in the monasteries of the period 14th - 16th century. Private parking for two cars. There is evidence handed down through the generations that there was a church on this site many years ago. 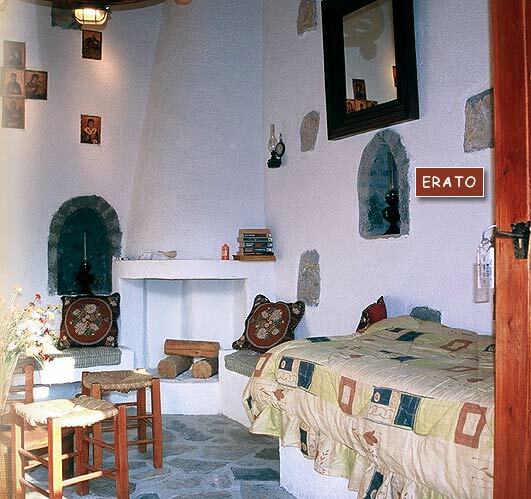 8)ERATO in the entrance terrace, there is a pool and a summer kitchen with BBQ shared with the House of CLIO. On entering, the Home there is the main room with fireplace and two single beds, a fully equipped kitchen and a small bathroom with Jacuzzi. Up the stairs to the master bedroom with an old double bed c 1920 and lamps which belonged to the church when intact. Cartwheels dating back to the beginning of the last century have been transformed into the main lighting. Kitchen utensils are copies of originals and the plates are of a type still in use in most villages of Crete. The House can accommodate four adults in separate rooms. Furniture and fittings are copies of original pieces presently exhibited in the Historical Museum of Crete in Heraklion. There is evidence handed down through the generations that there was a church on this site many years ago. The House can accommodate four adults in separate rooms. There is evidence handed down through the generations that there was a church on this site many years ago.